Seattle started strong but NOLA defence was swarming and Seattle had to leave the first possession with only 3 points. There was only one Canadian starting today, Brock Staller on the wing. Both Mack and Barton were on the bench. NOLA matched the penalty and at the quarter it was 3-3. Buydens at loosehead was up against Metcher at tighthead an interesting battle from the BC Premier perspective. Buydens absent from the Canada roster was a regular with CW and Metcher left Australia to play with the Nanaimo Hornets in their inaugural BC Premier year. He broke his arm before suiting up and then launched his MLR career with Seattle. At 26 minutes Mat Turner finished off a slick backline move that saw the visitors go ahead 10-3. 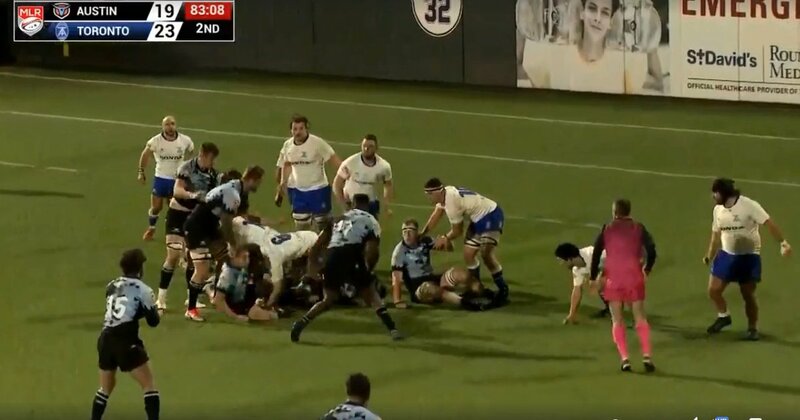 The lead didn't last long as the NOLA forwards pounded away at the line and at 33 minutes tied the match up at 10-10. NOLA finished off the half with a penalty try from a lineout and maul and the NOLA forwards were dominating in the first half, 17-10. 2 minutes into the second half, the Seattle scrum half, Phil Mack's replacement, JP Smith gets pinged for a high tackle, 20-10. 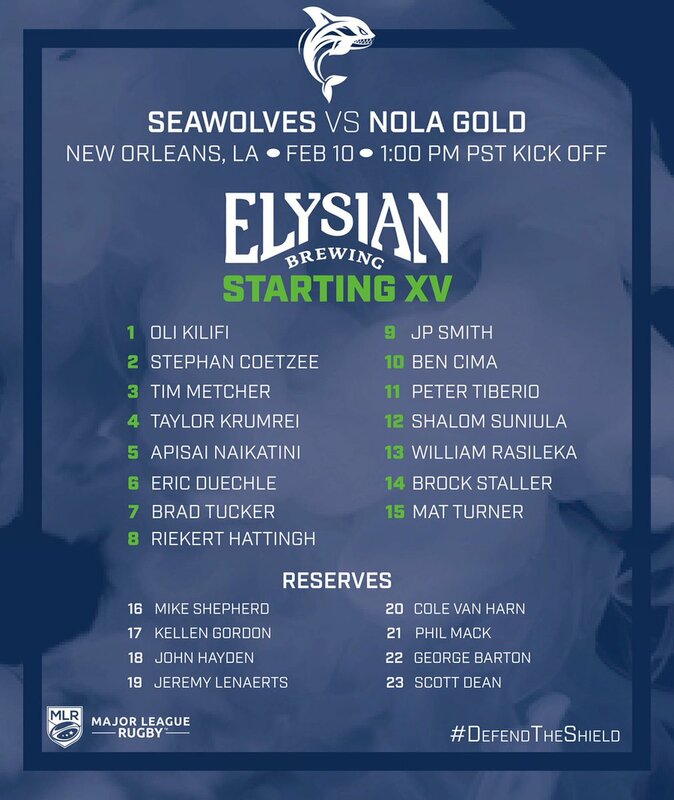 NOLA add to Seattle's misery with a line break from their fullback and a couple minutes later from a 5 metre scrum they go into multiple phases of attack from the forwards. They finally isolate their winger who steps and dives over, 27-10. At this point Phil Mack gets subbed in as scrum half. He gets the offence moving and at the 60 minute mark their big Fijian second row Apisai Naikatini goes over to make the game 27-17. Kellen Gordon, replacement prop, goes over 4 minutes later and it's a 27-24 match. 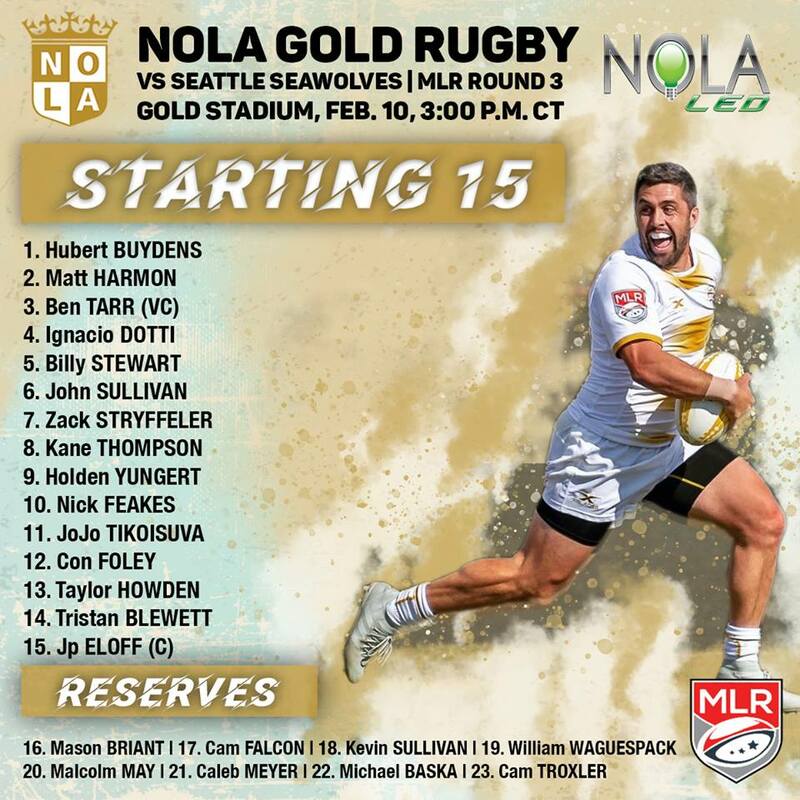 The NOLA winger Tristen Blewett scores outside 34-24 and off the kickoff they slice through the Seattle defence again through the backs, 41-24 with just 8 minutes left. Seattle score a consolation try 2 minutes from time with their #8 Riekert Hattingh finding a gap. Temperature in Austin was 33 deg Fahrenheit so just above freezing. Several players from both teams were with their national sides. Arrows missing players like Mike Sheppard, Theo Sauder and Kainoa Lloyd. 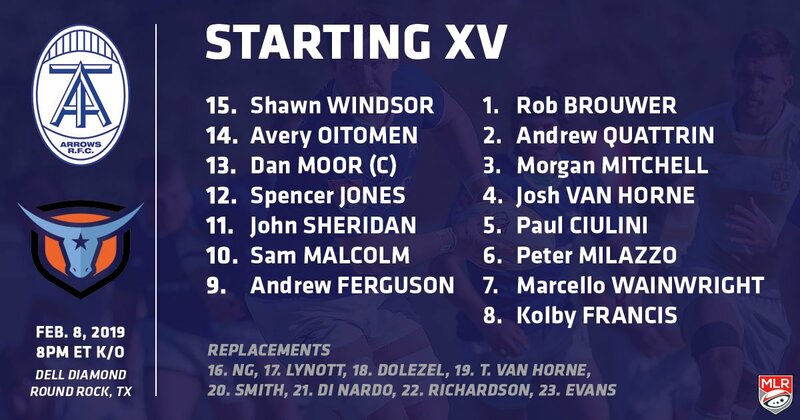 Toronto's scrum had early ascendancy the front row is Rob Brouwer, Andrew Quattrin, Morgan Mitchell. Mitchell is from New Zealand and has played at the Mitre 10 Cup level with the Southland Stags. Spencer Jones at #12 setup the first try for Toronto, he was playing with Westshore in the BC Premier league since October 2018 before moving to the Arrows for the MLR season. It was 5-3 for Arrows at the end of the first quarter. Try scorer for Arrows was #14 Avery Oitomen. 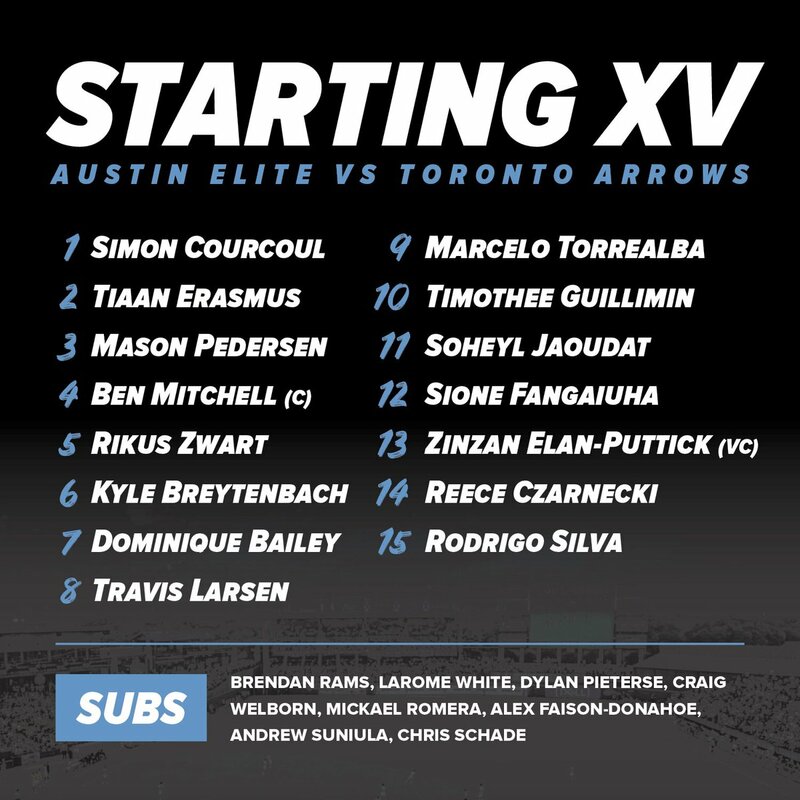 The Austin scrum half, Chilean Marcelo Torrealba, found the Arrows defence napping and snuck around the edge of the ruck and ran in for a try, halftime score was 10-5 for Austin. In the second half the teams exchanged penalty goals, 13-8. Toronto's scrum pushed Austin back into their goal area and Arrow's #8 Kolby Francis touched it down for a try, it was 15-13 for Toronto. Toronto added another penalty for an 18-13 lead. Two penalties in a row for Austin and they led 19-18. Toronto missed a penalty and the score remained 19-18 with 10 minutes left. Dan Moor blocked a clearing kick with 5 minutes left and chased it down to score a go ahead try, 23-19 for Arrows after the missed conversion. A nervous last 5 minutes for the Arrows as their penalty count mounted up. Austin were given a lineout deep inside the Arrows 22 with the clock expired, the next stoppage of play would end the match. 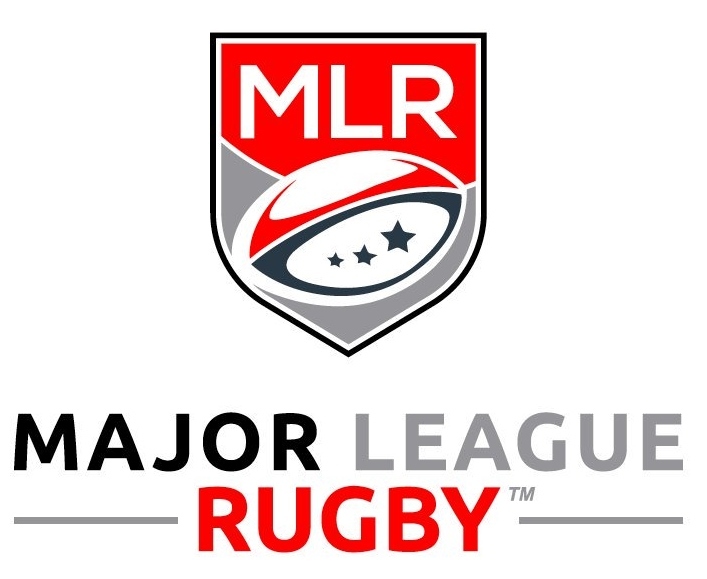 Toronto with a strong counter ruck earned a penalty and Riley di Nardo at scrum half kicked the ball out for the first win for the new MLR franchise. Toronto's dominant scrum helped them at key times creating penalties and gave them their second try. Dan Moor was the impact player of the match creating a try from a blocked kick and chasing it down for the third try. A key play with time expired was the counter ruck that created the turnover with Austin threatening to score. Congrats to Arrows on their first win. The full match video is below. Note: Reviewing the last play, the counter-ruck (see below), #6 Peter Milazzo deserves kudos on that.